Kumbha Mela is the sacred holy pilgrimage in Hinduism. Kumbha Mela 2013 Dates are from January 14, 2013 to March 10, 2013. Kumbh Mela 2013 will be taking place at Allahabad – Prayag – Sangam in Uttar Pradesh in India. Detail dates and calendar 2013 is given below. Kumbh Mela takes place once in 12 years at four holy locations in India – Allahabad, Nasik, Ujjain and Haridwar. As per Hindu religious tradition, Kumbh Mela takes place when the planet Jupiter enters Aquarius (Kumbha Rashi) and the Sun enters Aries (Mesha Rashi). 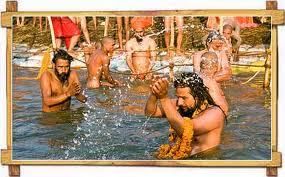 The popular belief is that bathing during Kumbh Mela helps in attaining Moksha. Pilgrims and saints from around the world arrive for Kumbh Mela making it one of the largest conglomerations of human beings on the earth. Hindus taking holy dip on the day in sacred rivers. Sangam at Allahabad is the confluence of three holy rivers – Ganga, Yamuna, and Saraswati. The Kumbha Mela takes place here. This is the biggest Kumbh Fair and is known as Mahakumbh Mela.